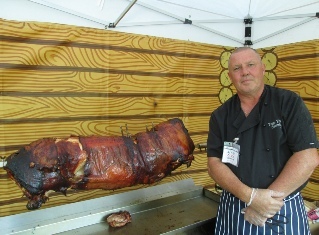 Mobile pig catering: No one will have any doubt what’s being cooked on your outsidetrade stand with the distinctive aroma of the pig being slowly roasted and when it is fully cooked, then the bliss of the taste, Mmm Mmm! 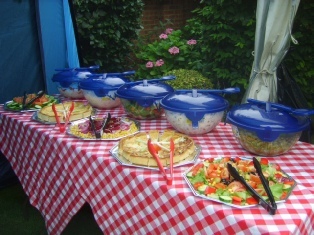 Presented from a show stand of a marquee with dressed tables and if requested a wonderful display of side salads. The pig is carved by the chef (who can be suited in your company look) and dished up in to bain maries. 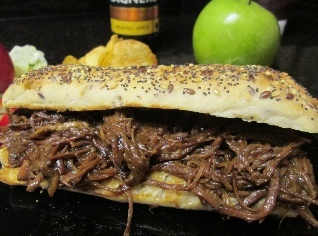 The carved pork is then served in a buns with apple sauce or a choice alternative sauces. 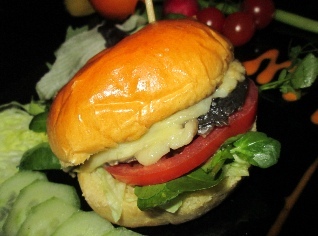 Vegetarian options can be provided; quiche, sandwiches, veggie burgers and sausages, Oh and let’s not forget the salads. We are happy to cook within our turbo ovens; pork joints / pulled pork. Which can be served in rolls or mini bite size rolls. 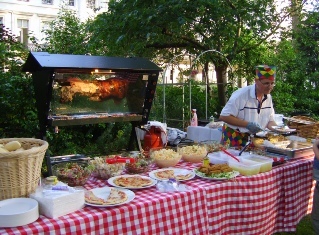 as an alternative to outside catering, when cooking is required inside the exhibition centre. Helpful Chef and assistants. Trade show catering. The marquees we use are art-worked in a wood effect. Each Marquee is 3m x 3m. One for the roast and carving area, one for the salads, one for the deserts etc. 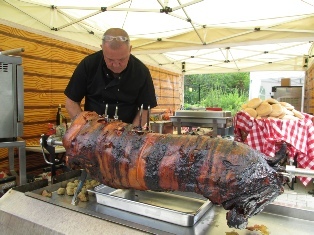 The pig roast oven runs on a 12 volt battery and uses LPG to cook the pig. The Ovens for cooking joints used are 3,000 watts; so an independent socket is required for each oven either by an 13 amp or 16 amp. Alexandra Palace, Business Design Centre, Beaumont Estate, Lilliebrook Manor, Mill Ride Golf Club, Dorney Lake, Ascot Racecourse, Royal Windsor Racecourse, Royal County of Berkshire Polo Club, Coppid Beach Hotel, Bisham Abbey, Legoland, Eton Rowing Club, Royal Holloway, Egham, Go Ape, University of London, Coworth Park, Englemere, The Jurgens Centre, Englefield Green, Taplow, Holyport, Staines, Langley, Slough, Maidenhead, Burnham, Beaconsfield, Gerrards Cross, Virginia Water, Winkfield, Warfield, Datchet, Sunninghill, Sunningdale, Bray, Farnham Common, Stoke Poges.